The new Alfa model is equipped with two JTS direct injection petrol engines with Twin Phaser technology: a 260 bhp 3.2 V6 Q4 unit and a 185 bhp 2.2 JTS unit. Both power units represent Alfa Romeo’s interpretation of the direct injection petrol engine, which means driving satisfaction and high performance for the customer. Both engines adopt the direct injection JTS (Jet Thrust Stoichiometric) combustion system. Both engines deliver the quality one expects from Alfa Romeo, having been fine tuned on the Balocco test track, while final assembly takes place in the Alfa Romeo plant in Pomigliano The JTS engines naturally meet the Euro 4 limits. Both engines are combined with six speed manual gearboxes which feature short spacing, crisp shifts and low loads. The Alfa Romeo ‘cuore sportivo’ really beats in the new V6 3.2 litre JTS petrol engine, which delivers 260 bhp. 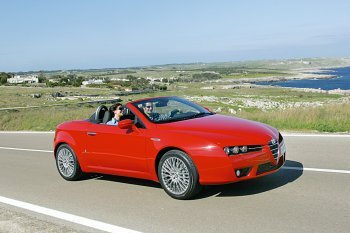 It represents a significant departure from Alfa’s previous V6 engine, as well as its natural successor. The new JTS engine is capable of a power delivery of 260 bhp (20 bhp or 8% more than the previous 3.2 V6 Q4); peak torque of 322 Nm at 4500 rpm (+ 33 Nm, an increase of more than 11%); a specific power of 60 kW/l and specific torque of 100 Nm/l; a significant increase in torque at low speeds to improve the smooth delivery (approximately 30 Nm more than the previous 3.2 V6 engine, starting from 1,500 rpm); maximum revs of 6,200 rpm; minimal maintenance (hydraulic tappets and timing gear with chain drive); low weight (aluminium cylinder head and crankcase); and Euro4 exhaust emissions limits. 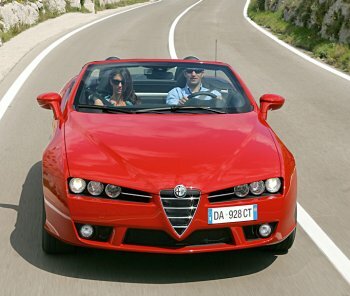 With this equipment, the Alfa Spider can reach a top speed of 235 km/h and accelerate from 0 to 100 km/h in 7 seconds. The new 6-cylinder engine fitted to the Alfa Spider continues the strategy begun with the 4-cylinder engines, and adopts the JTS (Jet Thrust Stoichiometric) direct injection system. This is an original Alfa Romeo concept that injects the fuel directly into the combustion chamber with a stoichiometric mixture optimised to enhance performance, but also guarantees low consumption and respect for Euro4 emissions limits. Numerous important components have been designed from scratch and are exclusive to the Alfa Romeo V6 engine. To start with, the cylinder head is aluminium and has 4 valves per cylinder, 2 camshafts per bank with the ‘Twin Phaser’ (continuous variable valve timing, intake and exhaust) already adopted on Alfa Romeo 4-cylinder engines and now applied on a 6-cylinder engine for the first time. Variable valve timing allows the phase angle on both cams to be varied by 50°, maximising performance on one hand, because the best phase can be chosen at all engine speeds, and reducing consumption and emissions with partial loads on the other. At the same time it is possible to optimise the volumetric efficiency of the engine over the whole operating range, exploiting the degrees of freedom offered by variable valve timing: this means a very favourable torque curve, with 90% of peak torque available from 1,800 rpm (290 Nm) and maintained over a broad range (from 1,800 rpm to 6,250 rpm). The valves are controlled by a roller finger system, with low mechanical dissipation, and hydraulic uptake of tappet play. Another peculiar feature is the camshaft drive system which uses a primary chain that transmits the drive to the heads via two secondary chains. Tension is provided by automatic hydraulic tensioners, which need no maintenance at all during the life of the engine. The high pressure fuel pump of the direct injection system is mounted on the cylinder head, driven by a camshaft, maintaining the pressure of the injected fuel at 120 bar by a built-in pressure regulator. The inlet ports and combustion chamber assembly is designed to optimise the air-fuel mixture, to achieve the correct turbulence of the inlet air, forming a homogeneous mixture, for stable, complete combustion that produces fewer pollutants. The four valves per cylinder with diameters of 33.4 mm on the inlet and 28.4 mm on the exhaust guarantee suitable permeability to enhance engine performance. The volumes and port geometry of the aluminium inlet casing have also been adapted to the high air delivery of the high revs to enhance performance. The electronic throttle body with a 72 mm throttle valve is mounted on this casing. And lastly, the compression ratio of 11.25:1 guarantees excellent engine performance even with regular 95 octane fuel. The 3.2 V6 Q4 engine features an exhaust system that includes a first group of catalysing elements relatively close to the cylinder heads to reduce the emissions level at the start of operation. Two catalysts under the floorpan and four lambda sensors complete the system, so that the engine respects Euro 4 limits without adopting special systems such as secondary air or electric heating. Another feature of the 3.2 V6 Q4 engine is the direct injection system (the fuel is supplied directly to the combustion chamber) whose main advantage is that it improves evaporation and this increases the engine’s volumetric efficiency. As a result, the supply of air and petrol is both denser and colder, which allows the compression ratio to be increased to 11.25, even if Euro Super petrol is used, with an octane index of 95 RON: a high compression ratio is useful because it makes it possible to increase both the performance and the energy efficiency of the engine. Lastly, ignition is provided by a single sparkplug per cylinder. Direct injection combined with 4-valve-per-cylinder geometry creates a mix that tends to be more concentrated at the centre of the combustion chamber. The ignition system features a single ignition coil per cylinder. To start with, the Twin Phaser system adopts new cam lobes which allow the phase angle to be varied by 50° on both axes. This makes it possible to improve performance on the one hand because the best phase can be chosen at all engine speeds, and to reduce consumption and emissions with partial loads, by the Miller cycle. This combustion system, which is based on the postponed opening and closing of the inlet and exhaust valves – extends the expansive phase (converting more heat into energy), guarantees internal EGR (by preventing the release of the last exhaust gases, full of unburned particles) and postpones the closure of the inlet valve (reducing pumping losses). 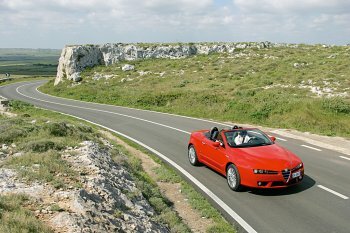 Another peculiar feature of the 2.2 JTS engines that equip the Alfa Spider is the chain-driven camshaft system: unlike a conventional belt drive, this system has the advantage of not needing to be replaced during the lifespan of the engine. 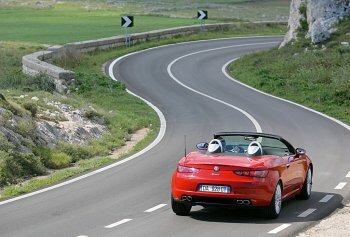 And to guarantee the performance one expects of an Alfa Romeo, the timing curve has also been reviewed, adopting larger profiles which made it possible to achieve a maximum power output of 6500 rpm (the system is fine tuned to operate at over 7,000 rpm, the maximum rev speed allowed by the electronic speed limiter). And more. To achieve the best volumetric efficiency, the maximum lift reaches 10.3 mm, while to enhance vibrational and acoustic comfort, the engine is equipped with two counter-rotating balancer shafts which virtually eliminate the second degree alternate forces that are typical of straight-4 engines. The generous power delivery of the engine (80 bhp/l on the 2.2 JTS) made it necessary to adopt sodium-cooled exhaust valves. The combustion chamber is shaped like a roof with four valves per cylinder: with a bore of 86 mm, the large inlet valves measure 35.3 mm and the exhaust valves 30.3 mm, guaranteeing excellent permeability to enhance engine performance. And, in spite of the stroke of 94.6 mm, in order to limit the overall height of the engine, the engineers have modified the piston height, achieving a compression value of just 28 mm, which is excellent in view of the high power delivery. Where the exhaust, injection and ignition systems are concerned, the two 4-cylinder JTS engines both adopt the strategies and features illustrated for the new 3.2 V6 Q4 engine.